Well before its May 21st reveal, certain rumored details about Microsoft’s offering to the eighth console generation was already meeting a highly criticized and unpopular reception. While concerns varied from price points to the newly included Kinect Sensor, what really set tongues wagging (or fingers typing in most cases) was the confirmation of the Xbox One’s online requirements. While Microsoft was elusive with details at first, eventually it was described as being a daily online ‘checking-in’ to verify publisher specified DRM requirements. This made many gamers… upset. The resulting outrage by core gamer base was so intense that Microsoft quickly reversed its position, announcing a repeal of the original online requirements to be replaced by a new doctrine. Fans at large rejoiced at what was being generally considered a ‘consumer victory’, but it appears that not everyone was thrilled with Xbox changing its controversial stance. Organized by David Fontenot via change.org, a petition has surfaced to bring back the Xbox One that was promised at E3. Online reactions to this most recent addition to Microsofts growing PR nightmare are violently, and predictably, reminiscent of the original debate. Privacy and ownership concerns captain one side of the argument, while increased online integration and ease of access govern the other. However the most interesting piece of selected ammunition in all of this may be the back and forth accusations of one side being more or less informed than the other. While I’m certain most parties concerned with this argument are aware of it already, considering the amount of times I’ve already had people confuse Downloadable Content (DLC) with Digital Rights Management (DRM) during recent conversations, I feel a need to clarify the difference. DLC are extras unlocked or added to a game post its release to expanded the originally purchased content. There are other debates about whether or not this is material “we should’ve had from the start” or “xtras we receive for showing loyalty or paying more,” but that’s a separate conversation. DRM are technologies used to control the distribution and/or use of various digital content after the point of sale. Even this is a very loose definition, considering these restrictions change constantly and can be different from one distributor or manufacturer to the next. While far from the only argument, the lion’s share of irritation aimed toward the Xbox One’s DRM policies was concerned with how daily online check ins would affect potential buyers or Microsoft supporters who either didn’t have internet service or didn’t want their gameplay decisions dictated by such. DRM itself is not the highlighted problem, but the interpretation and execution of it. While it’s possible that Microsoft truly had harmless and even benevolent intentions with their online direction, the way they’ve handled the public interest has, at best, been clumsy. Trouble really started for Microsoft and it’s always online concepts with issues concerning the most recent SimCity. Slow connection speeds, data loss, and online requirements, even for a single player game, quickly threw the title down the rabbit hole of buyers ill will. Amazon quickly tallied over 3000 negatives reviews, and publisher EA soon ceased sales of the game to correct what had become a game breaking issue. Soon after, leaks concerning the then gamer named “Xbox 720” and it’s always online requirements lead to the Twitter disaster circling Microsoft employee Adam Orth. Orth, who claimed to be harmlessly harassing a friend, was quoted saying in reference to gamers upset by the needed online possibility: “that those people should definitely get with the times and get the internet” and “deal with it.” The quote quickly evolved into a viral meme, and within days Orth was reported to no longer be with the company. 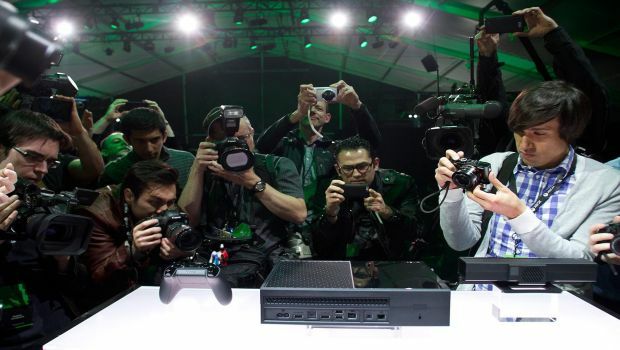 Even though Microsoft didn’t speak on the implications of the next Xbox constantly requiring an online connection, gamers seemed relatively convinced and began drawing lines in the sand. By the time of Xbox One press event and the following E3 presentation, the infant console was already treading water. All of this goes to show that the current brouhaha surrounding the gaming community is the tsunami that follows the earthquake. At this point it would be safe to assume that most early adopters of the new generation of consoles have formed an opinion on the products and the companies behind them. While this petition may voice the views of what has been a largely unheard audience, its doubtful it will change anything at this stage of the game. Microsoft can always change their policies after the Xbox One has gained a base, and publishers already enforce DRM policies on titles in the current market. At this point the gaming train has left the station and all we as fans can do is speculate and maybe even ‘hope’. Between now and then maybe we should all continue to focus on the influence we’ve proven to have and not fall into the trap of talking past one another. Microsoft has plenty of option to make everyone happy, and Sony had plenty of places to stumble and let us down. Now that we know our voice can be heard let’s make sure we at least all know what we’re saying. At the time of this writing Fontenot’s Petition had acquired 10,000 signatures and a few responses from supporters and haters alike. Amazon has removed the majority of negative reviews regarding Simcity, and Xbox has not posted any official comments regarding Fontenot’s petition.